Revoltech is once again back at creating more Disney characters in their line and this time are introducing Stitch. Stitch has the articulation of a Revoltech, but this figure is much fuller and bigger than the traditional Revoltech releases. Overall, this is a great sculpt of Stitch and his paint job is also colorful and vibrant like in the movie. Usually all Revoltechs are finely produced but this new Movie Revo Series seems to push that level of detail even further. Stitch can be posed in any which way you want and your imagination is really the only limit to what you can do...that being said though the only pose he can't do is his sit down dog pose. Sadly, the figure has no torso articulation so this feat can't be accomplished. Stitch can stand fairly well on his own two feet and the figure is somewhat well balanced. He stands about 4 inches tall, but he seems much bigger than your average Revoltech. You can also have him go on all fours and his neck joint allows his head to reconfigure into an all fours position. Every joint on his body can move and you can even adjust how much of his gum shows when you open his mouth. 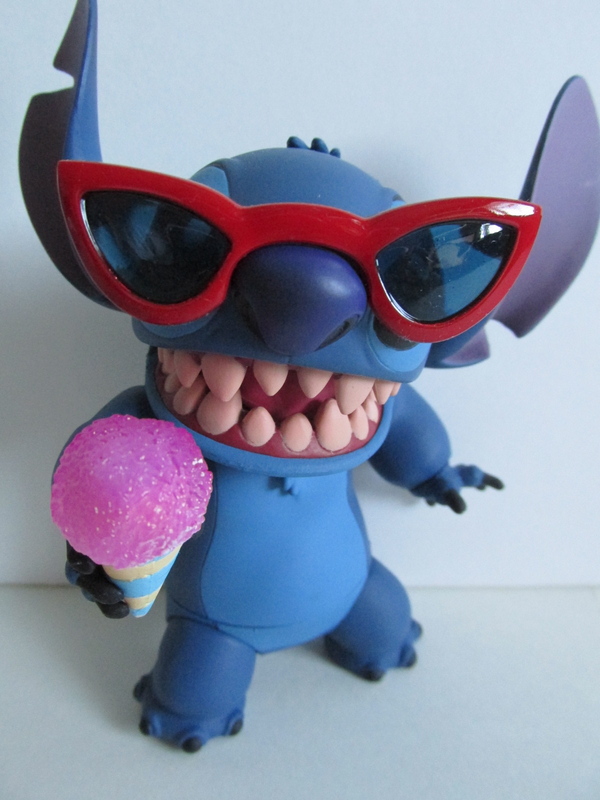 Stitch comes with a bevy of accessories such as shaved ice, red sunglasses, pair of extra arms, pair of extra hands, antenna, back spine, and evil face sculpt. Another neat accessory is the Hawaii back drop that is in the box. I don't think it was intended to be used for display, but it still works nicely. The evil face sculpt is put on by simply removing his entire upper head and fits on a ball joint that is sticking in his mouth. 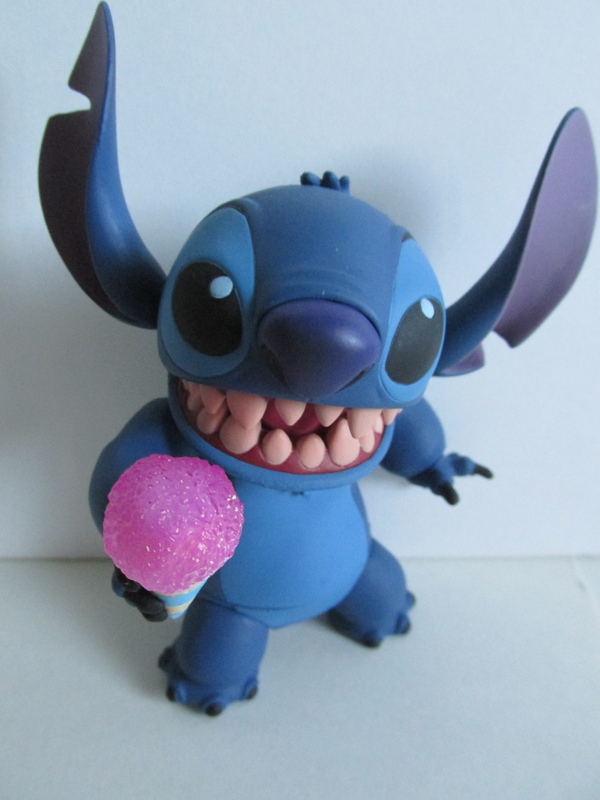 The evil face sculpt is a nice addition and truly fits Stitch's bad personality. My only gripe with this release is he can't do his sit down pose and the fact he did not come with his blasters or ukelele. It would have been great if he came with four blasters to hold for his evil face pose and a ukelele for his neutral pose. I think it was kind of a missed opportunity, but hey maybe a future release may contain these props. Lilo and Stitch fans should not miss out on this release. This is a great representation of Stitch and here's hoping we get a Lilo release.